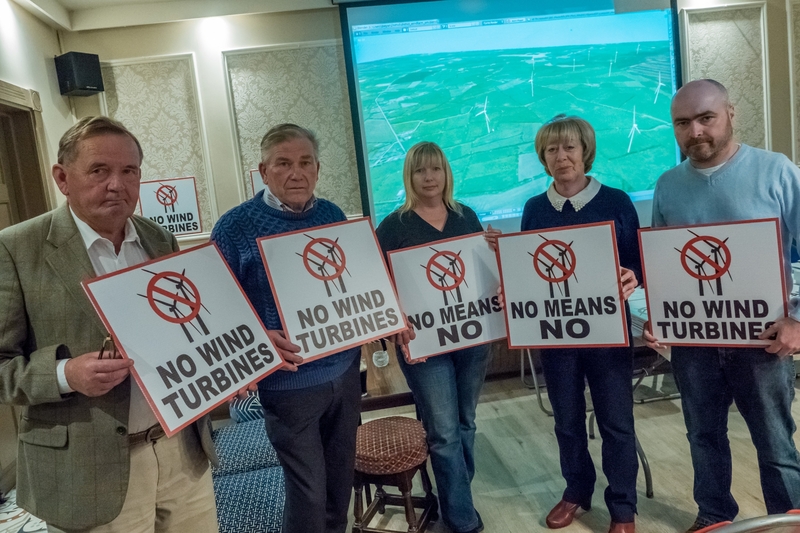 “Maybe I should call you all troops or soldiers as this is a war, as you know," said Seamus Langan, Chairperson of Drehid Against Wind Turbines as he addressed last Wednesday's (September 5) meeting at the Castle Inn in Carbury. He was referring to the company's plans to build a wind farm in the locality. "The crowd in attendance remain steadfast in their determination to stop these industrial turbines being erected in their area," said a spokesperson for the group. “Without a shadow of a doubt I am against this wind farm - I certainly will not be supporting it," she concluded. When asked “if you were in power will you be against wind turbines”, he replied “I would not be in this community - but off shore. "Brendan Wyse showed a Computer Simulated Presentation of the proposed industrial wind farm, which demonstrated the effects of these industrial wind turbines will have on our lives, wild life and landscape," said the group's spokesperson. "It was stated that a wind turbine that caught fire in Cork threw it’s flaming blade as far as 100 metres and landed close to nearby gorse and forestry. These incidents with wind turbines are a serious cause of concern to the community. "A meteorologist who attended the meeting, believes from his studies of the weather patterns including the reverse of the jet stream that wind power just doesn’t work on shore in this country due to lack of consistant wind." The spokesperson said the mood of the meeting was a steely determination to "put a stop to this proposed wind farm and to restore peace in the community." He said “ Keep up the pressure and for everyone to purchase a uniform and a helmet as we are going to war."